I haven’t done a theme month of sorts for a good long while. I think the last time I had one was either Eden of the East movie month or Satoshi Kon month. I think I am way overdo for a theme month. So for the next three reviews, starting today, we’re going to be having a month of Saya where we take a look at the entries of the Blood franchise to see where the franchise stands now and see where it gained ground! First, let’s start with the latest entry, Blood-C! 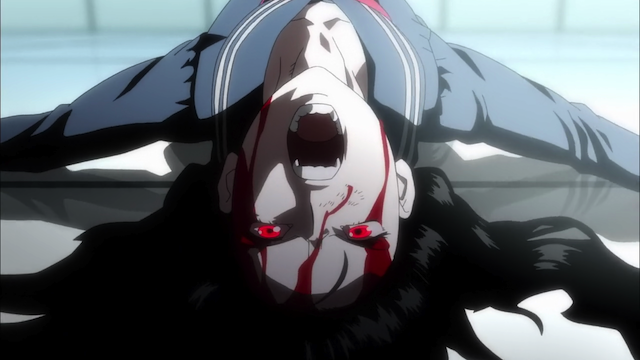 Blood-C is a 12 episode Action/Horror series from director Tsutomu Mizushima and Production I.G. with CLAMP also taking part. 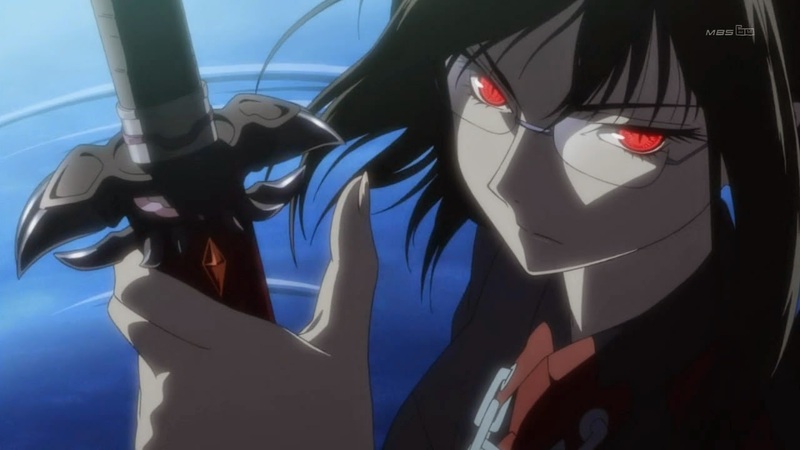 Originally airing during the summer 2011 season, Blood-C also has a manga adaptation that was released from Kadokawa Shoten between 2011 and 2012. Meanwhile, Blood-C: The Last Dark is also from Production I.G. and CLAMP, but this time with director Naoyoshi Shiotani at the helm and was released in June of 2012. 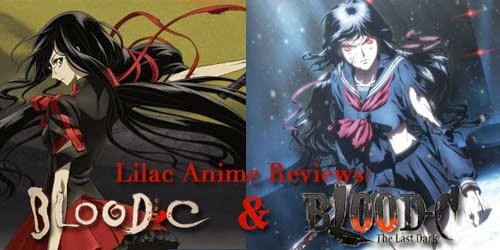 As of this review, both Blood-C and Blood-C: The Last Dark have been licensed by FUNimation Entertainment (US), Manga Entertainment (UK), and Madman Entertainment (AUS). In Blood-C, Saya is a seemingly normal girl living with her father in a shrine. During the day she goes to school and spends time with her friends at a local cafe. But when night falls Saya is called upon to protect her village from strange monsters. However, the more she fights them, the more she begins to learn their true nature. Not only that, but something inside of Saya is stirring as well. Is her life really all that simple? Or has it been a part of some experiment her supposed repressed memories keep alluding to? As for The Last Dark, six months after the events in Blood-C, Tokyo has enacted the Youth Protection Ordinance. Minors are forbidden to be out at night, and the internet is policed. Sirrut, an underground rebel organization, has declared war on Fumito Nanahara. 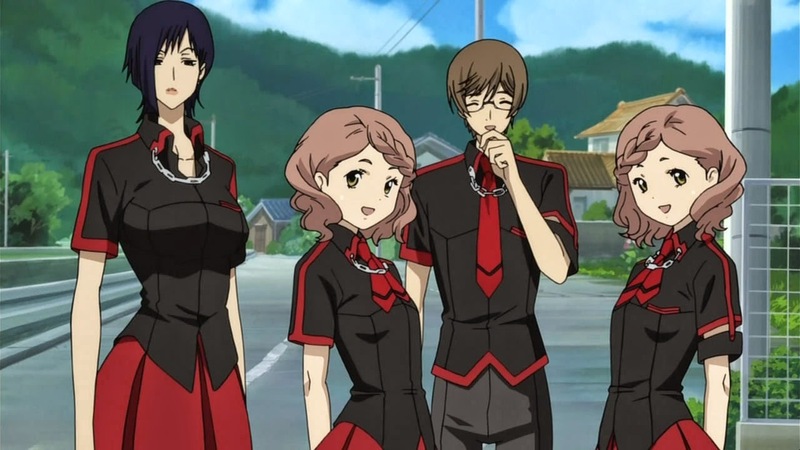 Sirrut uses the internet to try and find information in cyberspace, and they discover something more gruesome, TOWER, a mysterious organization behind Fumito that is rumored to be conducting experiments involving human beings, and alluding to people being...eaten. We have another Production I.G. work on our hands here, but this one is a little different. Now I’ve seen some amazing animation work from I.G. before like Ghost in the Shell, Eden of the East, and, hell, even Guilty Crown looked amazing. Blood-C is a little bit different because it’s not up there by I.G. animation standards. It’s not really a big stand out or isn’t really all that speculator looking. Between this and the other two Blood entries we’ll be seeing this month, I feel that Blood-C is nice and clean but is not as impressive. The only animation work I loved was the opening theme, even though the song wasn’t that good in my opinion. It’s also rather nice to be seeing CLAMP’s distinct style at play once again, though much of the character designs are easily comparable to other characters in the CLAMP universe, Saya and Fumihito specifically. In Fuimihito I can see parts of Tsubasa’s Fai D. Flowright while Saya really looks like the female version of Watanuki from xxxHolic. I’m not kidding, she really does! As for the soundtrack, it’s a lovely mix of both cheerful and haunting and I enjoyed it quite a bit. As for, The Last Dark, since it’s a film it’s going to gain a larger budget than the TV series. I’m more than certain that the budget was used rather wisely. The film looks much more put together and beautiful compared to it’s TV counterpart. It’s also a good contrast to the series as well since one has a lot more bright and cheerful moments and the other much more dark and solemn. This helps bring in the parts of Saya’s personality much more clearly, so good on I.G. for showing that. Although, that final CGI monster thing in the film... Did it really have to be all CG and stuff? Blood-C’s story takes some cues from Blood+ as Saya seems to have lost some memories and over time gains them back. What’s different about this is that the memory loss is THE plot. There’s nothing really else added in, and I have to give credit to the writers for sticking with that one plot line. Not only that, but they are able to make this plot line rather interesting up through to the end so I can’t fault it for keeping that consistency. The build up to the climax is as natural as you can get for a 12 episode series, with some of the twists not really seeming like twists once you reach a certain point and if you’re paying attention. Then there’s the ending of the series as it leaves the story unfinished. There’s much more to the story that is not covered in the series that if you just watched the series, you would feel unstasfied. Luckily, however, this also means when the story does get a conclusion, people will want to see it. This now leads me to Blood-C: The Last Dark. Now The Last Dark is a great place for the story to pick up from. Taking place six months after the end of the series, it takes on a different story line then the series but in the most logical sense. Without going into spoilers for those who haven’t seen the series yet, it’s basically a hunt for the mastermind behind everything. You can take that as you will. The film is what makes a better conclusion to the Blood-C story line much more than the series, but at the same time leaves the possibility of another film, series, or even a Saya cameo in the CLAMP universe wide open. I’m going to be doing the character section a little bit differently while working on A Month of Saya, and plan on focusing just on Saya. Seeing as how she is the one piece that has transitioned and been adapted into a few different parts of the franchise, I figured talking about these different Sayas would be a good way to see how the franchise entires differ. Now in the case of Blood-C, Saya Kisaragi is a rather happy and cheerful girl. Always singing, always looking on the bright side, and always enjoying life. At the same time, this Saya is completely oblivious. I get that this is for story reasons, but even she ought to be able to tell what a guy means when he says he likes her. I mean, that’s just silly. She is very determined and devoted to her duty to the point where I did question if her obliviousness was all an act. I’d say this Saya is certainly an interesting take on the character. Although parts of her personality do fall in line with the other two entires I’ll be covering this month, it stays with her more cheerful side the most out of any of them making Blood-C Saya rather oddly developed yet at the same time rather natural and believable when taking the story into account. The dub for Blood-C is rather well done, despite a couple odd scripting choices. From the TV series, Chris Burnett (Romeo X Juliet, Shiki), Bill Jenkins (Lupin III: The Woman Called Fujiko Mine, Robotics;Notes), and Scott Freeman (Baka and Test, [C] Control) give life to Itsuki, Tadayoshi, and Tokizane respectfully. Lindsay Seidel (Phantom ~ Requiem for the Phantom, Steins;Gate) pulls a double with twins Nene and Nono, though I would have loved to see two people playing these roles. 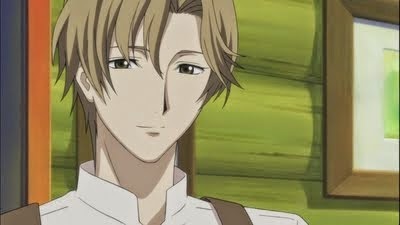 Kinda like what we got with Todd Haberkorn and Greg Ayres in Ouran High School Host Club. 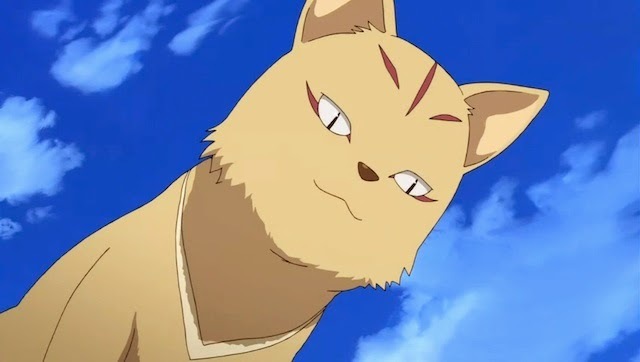 Speaking of Haberkorn (Fairy Tail, xxxHolic), we get a talking wish granting dog from him, and it was enjoyable (also because CLAMP). 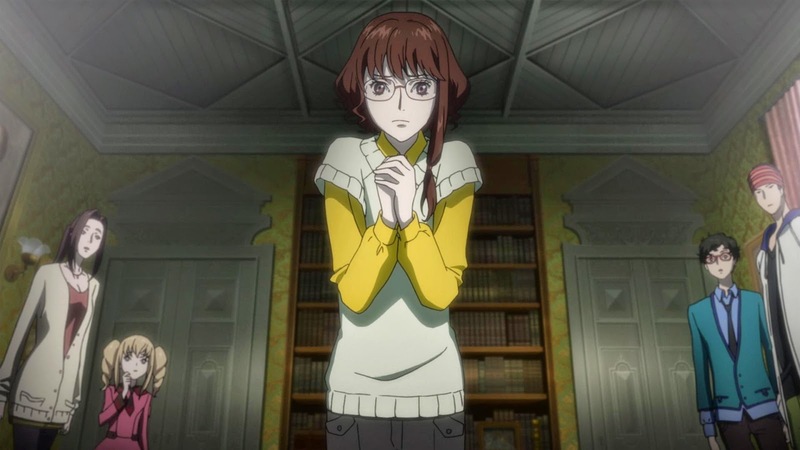 Martha Harms (Good Luck Girl!, A Certain Magical Index) is a fun new voice for me as she plays Saya’s friend Yuka. For the series, at least, it was fun and tolerable. The dub for The Last Dark has cameos from the cast of the TV series (including Haberkorn but this time not as a talking dog), but it also has plenty of new characters for us to enjoy. Mike McFarland (Wolf Children, Attack on Titan) plays double duty as not only the voice of Kuroto Mogari but as the film’s ADR Director as well. After seeing Wolf Children previously, McFarland has become one of my favorite Directors and his work on this film is no exception. Colleen Clinkenbeard (One Piece, Baccano! ), Tia Ballard (Kamisama Kiss, Rideback), Josh Grelle (Future Diary, Princess Jellyfish), and Justin Cook (Fruits Basket, Yu Yu Hakusho) each give wonderful performances as Yanagi, Hiro Tsukiyama, Fujimura, and Matsuo. Granted there were moments in Grelle and Cook’s performances that were a little over the top, but that’s ok. Jad Saxton (Michiko & Hatchin, Karneval) takes on one of the other major characters in the film, Mana. It’s certainly a stand out performance in my eyes and was one of my favorites from the film. There are a couple other voice actors that I wanted to mention separately because of their major involvement in both the TV series and the film. First up, Robert McCollum’s (Jormungand, Peach Girl) Fumihito. It’s a little bit different then what I’ve know him to be, and it’s a nice change. Not only do we have moments where he’s much more serious and slightly dark, but seeing the more light hearted Fumihito almost made unable to recognize him. 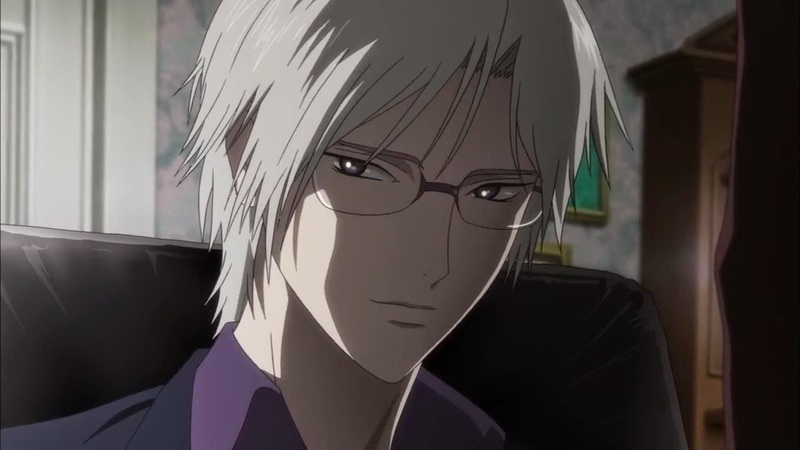 By far, one of my favorite performances from him yet (Mind you I haven’t seen Psycho-Pass so I’m expecting another awesome performance there)! Then, of course, we have to talk about our leading lady Saya. This iteration of the character is voiced by Alexis Tipton (Guilty Crown, King of Thorn). I mentioned previously with my Guilty Crown review that Blood-C was one of the series that helped her take off even more. I will say, I honestly didn’t think she had it in her but she did. Being able to show Saya’s different sides can sometimes be a challenge and I think Tipton took the challenge head on and gave a rather well done performance for both the series and the film. 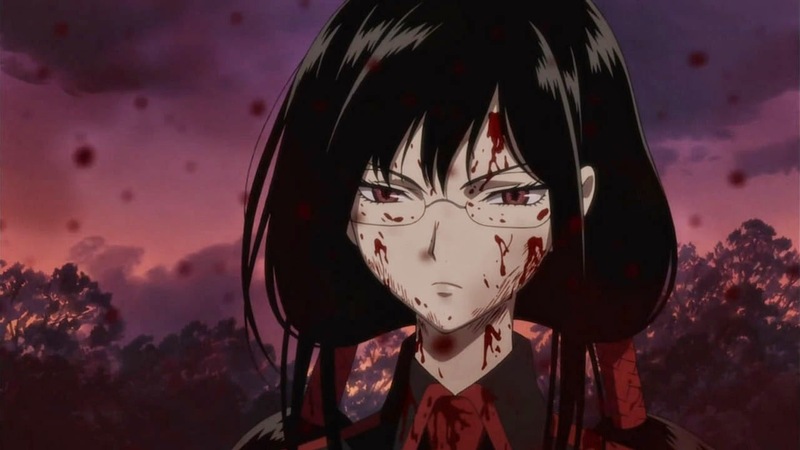 By the end of the experiment Blood-C, as a whole, is a different take on the franchise. It takes some cues form earlier entries, that we’ll be talking about soon, but adds in the flare of a CLAMP series. I know I’ve harped on CLAMP before with their adaptation of xxxHolic, but Blood-C makes up for it a little bit. However, there are still some moments that were confusing and seeing Saya as such an obnoxiously oblivious character did bug me a bit. In the end, it was a fun ride! It’s not my favorite entry of the franchise, but it comes at a close second. If you’re a huge CLAMP or Saya fan then you may enjoy this one. If all else fails, you can at least see the CLAMP universe keep growing. Next time, we look into the most well known entry of the Blood franchise. Until then, otaku on my friends! Also doggie! Think you know your CLAMP shows? 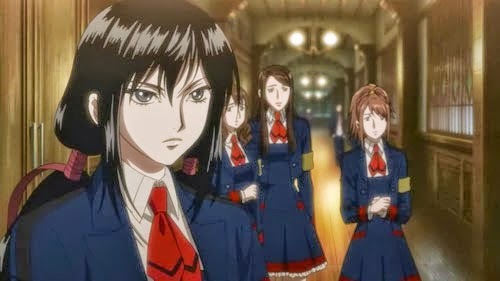 Blood-C Final Rating - 6/10 An interesting, yet odd, take on the franchise. Blood-C: The Last Dark Final Rating - 7/10 The perfect companion to Blood-C.
Over at Bonus Bitcoin Faucet you can recieve free bitcoins. Up to 5,000 satoshis every 15 minutes.